The secret to stress-free entertaining is good planning. If you can do as much as possible in advance, you can spend time with your guests rather than in the kitchen. Food With Friends is packed with great menus for casual lunches, dinner parties and more formal get-togethers. From a spring Sunday lunch to a smart dinner for eight, it is full of delicious recipes, as well as lots of advice on shopping lists and details of what to prepare the week/day before and even between courses. 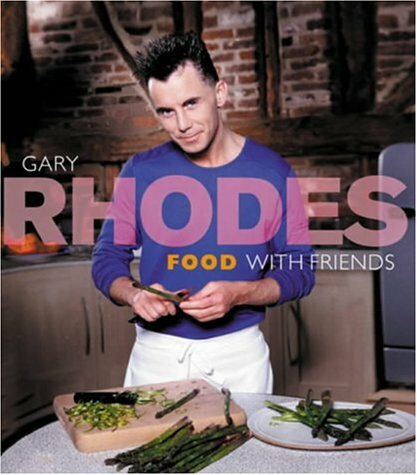 Accessible recipes with an interesting twist are what one expects from top TV chef Gary Rhodes, and this handy book, on a winning subject, should have a place on every cook’s bookshelf. Gary Rhodes’ legendary dedication to his craft and relentless pursuit of perfection has placed him firmly at the forefront of today’s culinary world. Chef, restaurateur, celebrity and author; his distinguished career, tireless attention to detail and unique mastery of the ‘Great British Classics’ truly sets him apart. A history of stunning restaurants has won him a constellation of Michelin stars and he is consistently revered by his peers as truly ‘The Chef’s Chef’. 29 years after graduating from Thanet Technical College in Kent, Gary is an extremely busy man. The start of 2005 saw his undisputedly successful London restaurant, Rhodes Twenty Four, with spectacular views over the City from Tower 42, winning its first Michelin Star. The restaurant has received rave reviews since it’s opening in 2003 and has seen its tables booked up for months. This is Gary’s fifth Michelin star. Rhodes Twenty Four is one of only a few restaurants in London with this accolade. In addition to Rhodes Twenty Four, Gary opened Rhodes W1 brasserie in the newly refurbished Cumberland Hotel in Marble Arch in 2005. He has also launched ‘Arcadian Rhodes’ aboard the new P&O Superliner, Arcadia and ‘Oriana Rhodes’ aboard the cruise liner Oriana. 2006 found Gary with a new restaurant venture in Dublin, Ireland, with the launch of his 250 seater brasserie, Rhodes D7. Gary opened his first overseas restaurant several years ago, premiering in the five-star Calabash Hotel on the beautiful ‘spice island’ of Grenada. 2007 saw Gary with many exciting projects, starting with the launch of his new Rhodes W1 Fine Dining restaurant at The Cumberland Hotel in May and Rhodes Mezzanine at The Grosvenor House Hotel, Dubai, in September. In January 2008, Rhodes W1 Restaurant was awarded a Michelin star, bringing Gary’s total to 6. This was the start of a busy and exciting year with the publication of Gary’s 19th book ‘365’ and the opening of ‘Kings Rhodes’ brasserie in August, followed by ‘Rhodes South’ restaurant in November, both in Christchurch, Dorset. The start of 2009 saw Gary travelling around the Caribbean to film his new television series and with many other projects in the pipeline, it is sure to be another exciting and eventful year. family meals whilst his mother was at work. His first major culinary achievement, at the age of 13, was a Sunday roast followed by a classic British dessert - Marguerite Patten’s steamed lemon sponge pudding. One look at his family’s delighted faces as they got stuck in was enough to convince him that a cook’s life was the one for him. After training at Thanet technical college (where he met his future wife, Jennie) Gary realised that he would need to travel if he was to expand his techniques and fully develop his career. Europe at that time was producing the best hotel chefs and cuisine, and his first job was as commis chef at the Amsterdam Hilton. Here, he began to experiment with nouvelle cuisine and started to challenge preconceptions of food preparation. Success was swift and Gary went on to become the sous chef at the Reform Club, Pall Mall and then on to the Capital Hotel in Knightsbridge. Eventually he became Head Chef at the Castle Hotel in Taunton, Somerset and this is where he really started to make a name for himself - he retained the hotel’s Michelin Star, at just 26 years of age! By 1990, when he joined the Greenhouse Restaurant in Mayfair as Head Chef, his reputation as one of the UK’s leading culinary masters was well established. Here, he revived great classics such as faggots, fish cakes, braised oxtails and even bread and butter pudding (which in his hands became a truly sumptuous dessert). With free rein to explore British cuisine, he embarked upon a gastronomic journey of discovery, reinventing and rejuvenating old favourites to create a new and incredibly exciting food. Nobody was too surprised when, in January 1996, he won a Michelin Star for the Greenhouse - the restaurant’s first, Gary’s second. Since then, he has gone from strength to strength - in 1997, he opened City Rhodes (with global contract catering company Sodexho, their first collaboration), and next, a year later, came Rhodes in the Square. Both were awarded Michelin Stars. Of course, during this time he was not only opening restaurants; by his own admission, his first foray into the world of TV at the age of 27 was a nerve-wracking affair. It came courtesy of Glynn Christian on the programme Hot Chefs, and it wasn’t long before he was given his own series. The tremendous popularity of shows such as Rhodes Around Britain and Gary’s Perfect Christmas have made him a household name. Pondering on such success 22 years and 16 series after those nervous beginnings, you could argue that it’s his unique ‘can do’ approach that has made him such a favourite, or it could be his charm and charisma. Probably, though, it’s the fact that he understands that the real star of the show is always the food. His book sales (and awards) would do even Jeffrey Archer proud, and magazines,endorsements, awards and accolades have all followed. Gary has cooked on almost every continent for royalty, prime ministers, presidents and all the president’s men! He has cooked on the QE2, he has cooked on the Orient Express. He has achieved many personal ambitions including cooking for, Princess Diana, the Jordan Formula One team, the British team at La Mans, and his beloved Manchester United. Amidst all the TV appearances, book signings and glitzy award ceremonies, there’s one thing about Gary that you have to understand - what Gary likes best is to cook. Gary lives in Kent with Jennie and his two sons, Samuel and George.